This is the 5th post in my depression series. You can read the first post here. 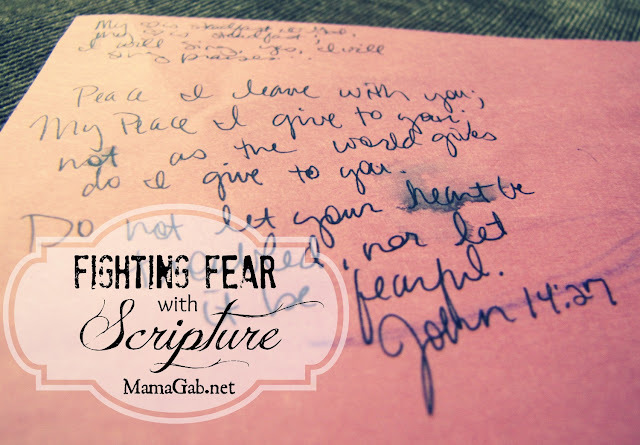 Last week, I shared about how God worked in my heart to show me that I was giving into fear. I was letting my joy be stolen. Instead of looking at my children and finding joy in them, I was having flashbacks to my newborn’s traumatic diagnosis and emergency lung removal. Because of this trauma, I was enveloped in fear of the future, of more terrifying illnesses and things I could not control. But once God showed this to me, I knew I didn’t have to live like that. Instead of giving into fear, I began fighting back against the dark thoughts and the emotions that I was drowning in. I believe that God had already equipped me to go through this battle. I shared with you a few weeks ago how God used people around me to pull me out of this fog of depression. I didn’t want to neglect fellowship with believers because the body of Christ is a tangible way to feel God’s love and have truth spoken to me. Even during the days that we spent in ICU when our son had his emergency lung surgery, the trauma that triggered my depression, I did not neglect time in the Word. It wasn’t out of a sense of legalism, because I knew God’s love for me was not dependent upon reading the Bible. But I knew that I needed God’s Word to be my spiritual food, my strength to get through each day. I think all believers need this, but a believer who is struggling with fear and giving into emotions needs it more than ever. 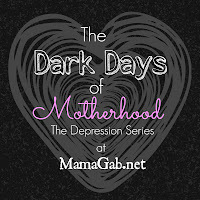 When we came home from the hospital and the depression started, I continued to spend time with God. I knew this would be the source of my hope. I needed to read about God and focus on the truth of who He is, how He works, and what He promises. I gave up my usual habit of reading through the Bible repeatedly and instead, I went swimming in the Psalms that spring and summer. I needed to be saturated in God’s word. Here’s where it gets pretty cool. 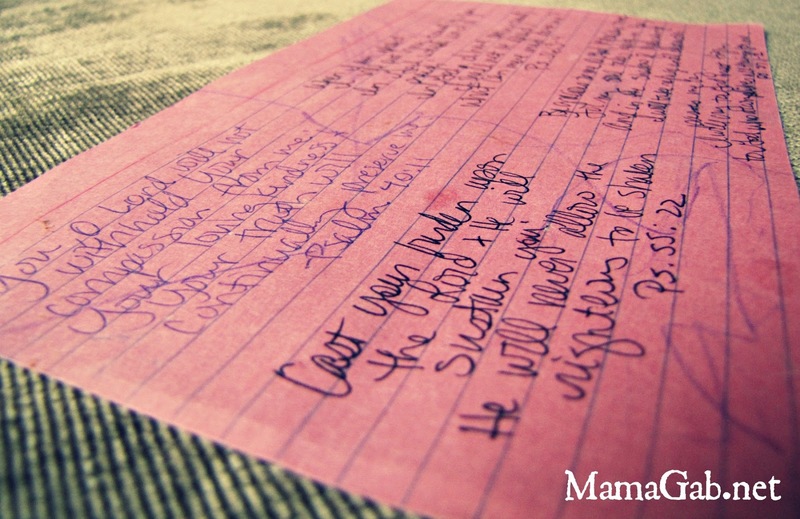 As I was reading, I began writing down scripture that encouraged me in my dark time. I wrote them down on large index cards that had been collecting dust in our desk drawers. One of my scripture cards, packed with verses and crayon marks from my toddler. Be gracious to me, O God, be gracious to me. I will take refuge until the destruction passes me by. 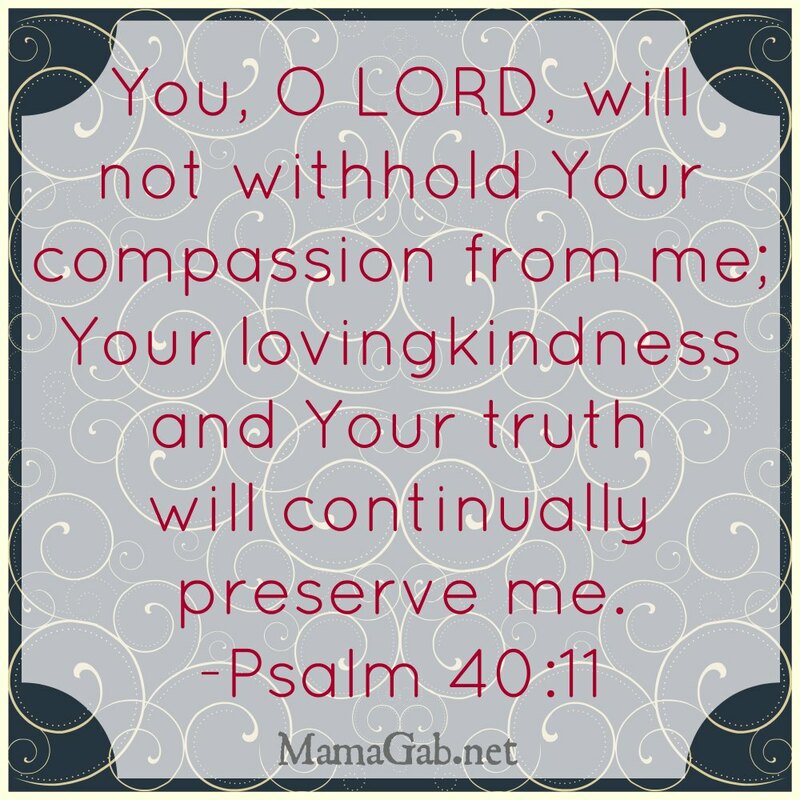 When I began feeling fearful, when I began crying uncontrollably, and when I would have terrible flashbacks to experiences in the ER or in ICU, I would grab hold of these verses. 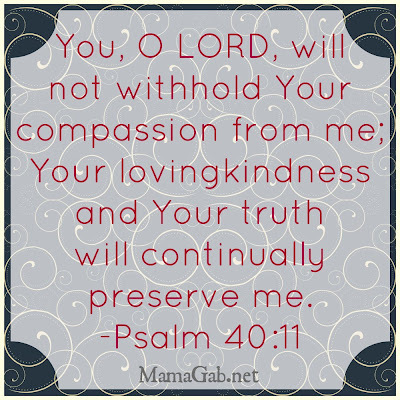 I would say them out loud sometimes, letting the truth of God overwhelm me completely. And when I became so terrified of something so small, I would do this all over again, focusing on the truth instead of lies, until God’s peace overwhelmed me instead of my fears. Next week, I will share in even more detail how God’s Word pulled me out of this fog by taking my thoughts captive. It will be my final post in this series. What are some of your favorite scriptures that you turn to in times of trouble? Although this wasn’t an enjoyable time for you, I very much have been enjoying this series. Thanks for sharing with us! Thank you!! I’m glad you’ve enjoyed it. One week left! Needed to read this – been flirting with depression the last few months, and like you can feel myself being pulled back into past traumas and fears. I’m thankful that God lead me to blogging which has been keeping me more focused on seeking Him and His word. He has given me lots of posts to write that have taught me a lot and that He is using to speak to me as I struggle. That is wonderful to hear. Blogging is a difficult balance sometimes, so I’m glad it’s been therapeutic for you and keeps you grounded in the Lord. That’s the most important thing. Yes, those index cards or a journal are a great way to record scripture that we can use as our food! Thank you for sharing this! Recently my husband had some tests that did not come back very favorable. We are in wait mode for his appt with the specialist. I am clinging to God’s word to focus on HIM and not the circumstances. HE will be glorified through this! I know He lead me to your series (Thru Thriving Thursdays) so that I would see His word and His promises!! I have used spiral index cards to memorize scripture… but this reminds me to go get one and fill it up with TRUTH for this journey. That is HARD! Those are great scriptures to focus on. Thanks for sharing them!